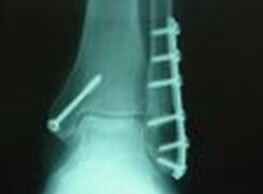 Ankle fractures can occur as a result of direct and powerful trauma or as a result of a severe twisting of your ankle. In certain situations you may actually hear your bone cracking. Severe swelling and black and blue discoloration quickly develop. Your pain might be quite excruciating, and/or the position of your foot might be altered. These fractures often require surgical treatment with open reduction and internal fixation. A postop xray of this type of procedure is shown to the right. Sometimes with severe ankle injuries subtle fractures of the articular surface of the talus occur. These are called osteochondral fractures. These are very difficult fractures to visualize on plain radiographs / x-rays and sometimes are only seen with either CAT scans or MRIs. This type of fracture which involves either a shearing of the cartilage of the joint or possibly even a subtle fracture through the cartilage of the joint and the bone underneath it, are called osteochondral fractures. The possibility of these fractures should be considered after severe ankle injuries and must be evaluated by a physician. Neglecting ankle fractures may result in the development of arthritic conditions and severe long term consequences.Once your ankle fracture is treated and healed, you will generally be able to return to normal function.